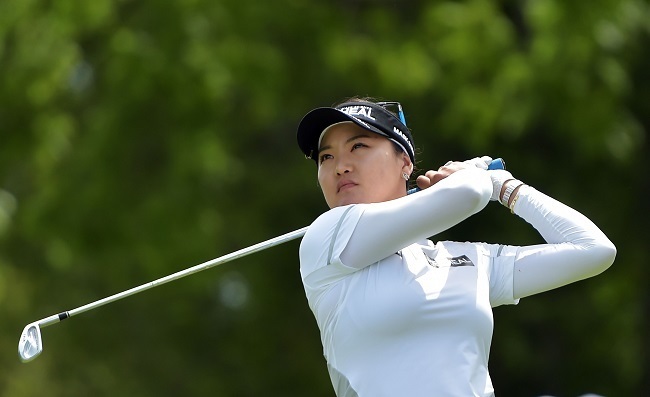 ROGERS, Arkansas -- A few weeks off was all Ryu So-yeon needed to kick-start what is shaping up to be possibly the best year of her LPGA Tour career. The third-ranked South Korean star shot a course-record 10-under 61 on Saturday in the NW Arkansas Championship to take a five-stroke lead into the final round, putting in in great position to become the first repeat winner this year. The ANA Inspiration winner in April for her second major title, she reached 16 under to break the tournament 36-hole record by two strokes. She had her lowest score on the LPGA Tour and matched her professional best set in the 2012 Australian Ladies Masters. Ryu opened the year with eight straight top-10 finishes, including the major victory. She struggled in her two events after that run, finishing 56th and then missing the cut at the ShopRite LPGA Classic this month in New Jersey. Coming off a two-week break, she has returned to her early season form -- and then some. Local favorite Stacy Lewis and Moriya Jutanugarn were tied for second. They each shot 65. First-round leader Park Sung-hyun followed her opening 63 with a 73 to drop into a tie for 10th at 6 under. Defending champion Lydia Ko was 5 under after a 67. A day after opening with a 65 in gusty afternoon conditions, Ryu preyed on the Pinnacle Country Club course on a calm Saturday morning. She needed only 25 putts, posting a 30 on her opening nine holes before closing out the blistering round with three birdies on her final four holes. Ryu capped the round with an uphill 10-foot birdie putt on the par-4 nine, much to the delight of the gallery. She also earned the praise of Ai Miyazato, the retiring Japanese star who finished a group ahead of Ryu and was nearby at the scorer‘s tent as the South Korean walked off the course. The previous course record was 62, set by Angela Park and Jane Park in 2008 and matched last year by Ko and Ayako Uehara. Ko went on to win the tournament with a record score of 17 under. Ko and Morgan Pressel held the previous 36-hole best at 14 under, set last year. Ryu nearly won the tournament in 2013, losing playoff to Park In-bee. She’s trying to win her fourth LPGA Tour title.